Challenge Bolvyn Venim to a duel to the death for the title of Archmaster. Speak to Athyn Sarethi for duties. 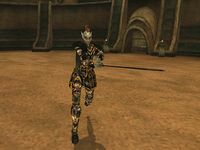 Go to Venim Manor and challenge Bolvyn Venim to a duel in the Vivec Arena. Travel to the Arena and defeat Bolvyn in the duel. Once Bolvyn is dead, you become the new Archmaster. Athyn Sarethi in his manor in Ald'ruhn will tell you Archmaster Bolvyn Venim will never allow an outlander to become Archmaster of House Redoran and that the only way to win the leadership of the House is to challenge Bolvyn Venim to a duel. Go to Venim Manor and talk to Bolvyn Venim to challenge him to a duel. He will greet you by challenging you to duel to the death in the Vivec Arena. Take a Guild Guide or Silt Strider over to Vivec, and enter the Arena to find Bolvyn. He is a tough opponent if you attack him one-on-one as he is heavily armored (ebony) and has a Daedric Dai-katana. Of course, he has no ranged weapons or spells so feel free to take him out from a distance as your honor won't be ruined. Healing potions and scrolls are helpful of course. Once Bolvyn is dead, you automatically become the new Archmaster. You may take what you want of his possessions, but some Redorans consider this dishonorable. If you have already killed Bolvyn Venim during the Redoran Hortator quest, Sarethi will name you Archmaster when you ask about duties. You may not get a journal entry when Sarethi tells you about the duel. This is not important, as the quest will be started properly when you greet Venim so it can still be completed. If you want to get the journal entry, type the console command Journal HR_Archmaster 10 . A similar bug prevents you from getting a journal entry for reporting back to Sarethi. If you want the entry, use the console command Journal HR_Archmaster 100. 10 Athyn Sarethi told me to meet Bolvyn Venim in a duel. The winner will become the Archmaster of House Redoran. 50 Bolvyn Venim challenged me to a duel. I will meet him in the Arena in Vivec. The duel is to the death. 70 I won the duel with Bolvyn Venim. I must speak with Athyn Sarethi before I can be named the Archmaster of House Redoran. 100 Finishes quest I defeated Bolvyn Venim and am now the Archmaster of House Redoran. This page was last modified on 29 June 2013, at 20:39.